Truth be told, I liked Mind Storm (Thomas Dunne) a lot better than I thought I would. Even in a market that seems heavily saturated with post-Apocalyptic tales (is it just where we are as a culture that we’re flocking there?) Mind Storm stands out and even above. Two Hundred and Fifty years from now, Threnody Corwin is a soldier-slave to the human government. Threnody is of the human class known as psion, the result of nuclear fallout. Like all of her kind, she has special psi skills. Hers is the ability to channel electricity. 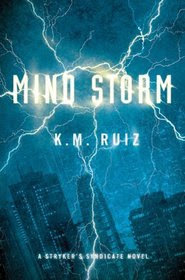 Mind Storm is the first of the Strykers Syndicate novels that set genetically clean humans against those, like Threnody, whose DNA has been damaged by nuclear activity. At present, only two novels are forecast for the series. There is a strong cyberpunk vibe here that puts one in mind of Blade Runner or Gattica. Though Ruiz’s prose is compelling, there’s something intensely grotty about it in a way that will not appeal to all readers. Even so, Ruiz’s voice is confident -- even muscular -- though there are also passages of real beauty.